An intelligent and flexible tool which offers a solution to fast charging requirements and can be installed when and where required. The growth and diffusion of electric mobility go hand in hand with the availability of dedicated infrastructure. This is why the Group has unveiled its future felxible fast charging station . The mobile charging station works according to the principle of a power bank for smartphones: it can be set up flexibly and independently of the power supply wherever it is needed, for example in public car parks in the city, at companies, or as a temporary charging point at large-scale events. 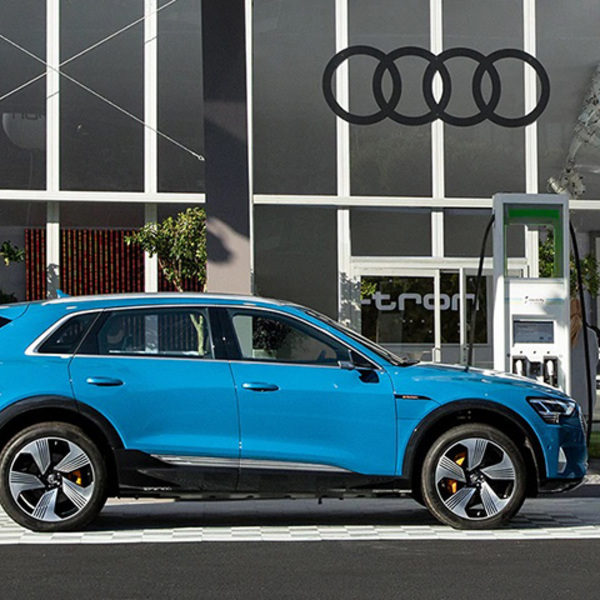 The charging capacity of up to 360 kWh enables up to fifteen vehicles to be charged in stand-alone operation, with an average charging time of seventeen minutes. The flexible stations can be easily located via the Internet or the dedicated app. Each charging station enables DC quick charging with up to 100 kW. In addition to electric cars, e-bikes can also be charged. Up to four vehicles can be charged simultaneously: two with DC and two with AC connections. 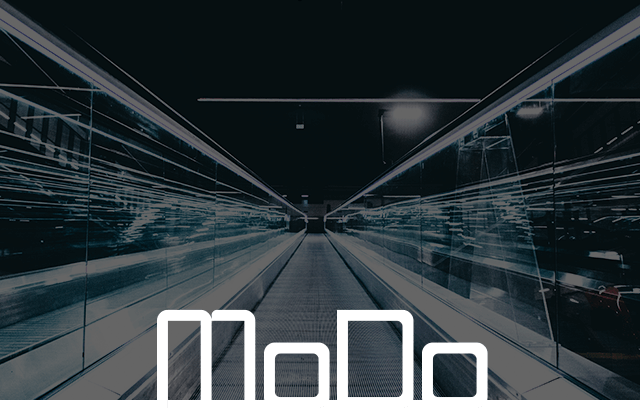 If the mobile station is not connected to a power supply, when the energy content of the integrated battery goes below 20%, the depleted charging station is simply exchanged for a charged one. If, however, it is permanently attached to a power supply with up to 30 kW via alternating current, the battery pack perpetually recharges itself. And that’s not all: when powered by renewable energy, the charging station allows the temporary storage of sustainably generated power, such as solar or wind energy – and therefore CO2-neutral mobility. 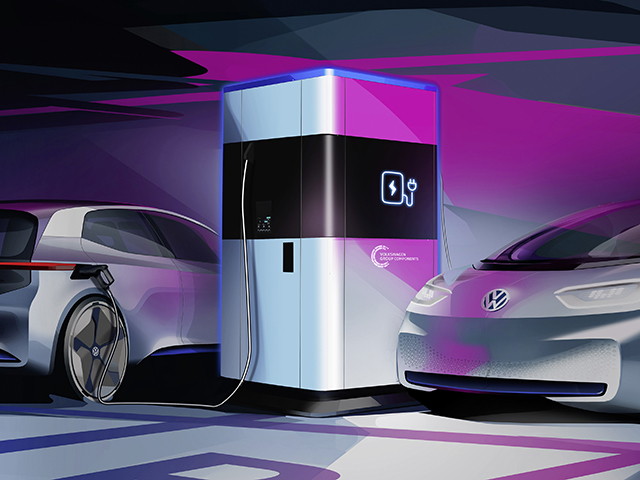 The first mobile quick charging stations will be set up as early as summer 2019 in Wolfsburg as part of a pilot project, and will support the expansion of a charging infrastructure in the urban area. As of 2020, the charging station will also be implemented in other cities and communities. “The flexible charging station allows a completely new approach to expanding charging infrastructure. 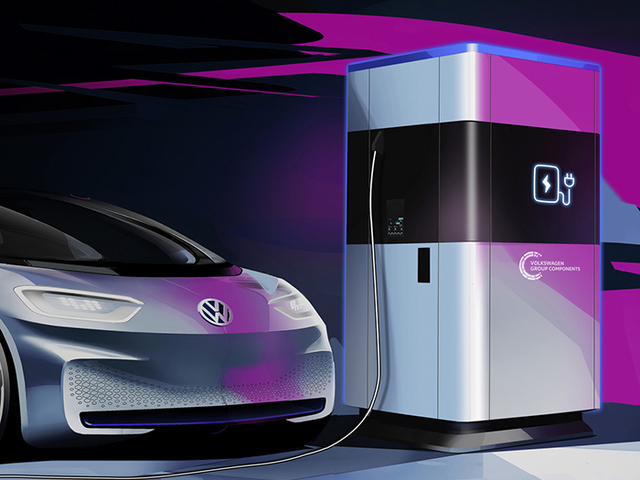 Cities can, for example, find out the most suitable places for a permanent charging point before making major investments in developing the network”, according to Thomas Schmall, Chairman of the Board of Management of Volkswagen Group Components. 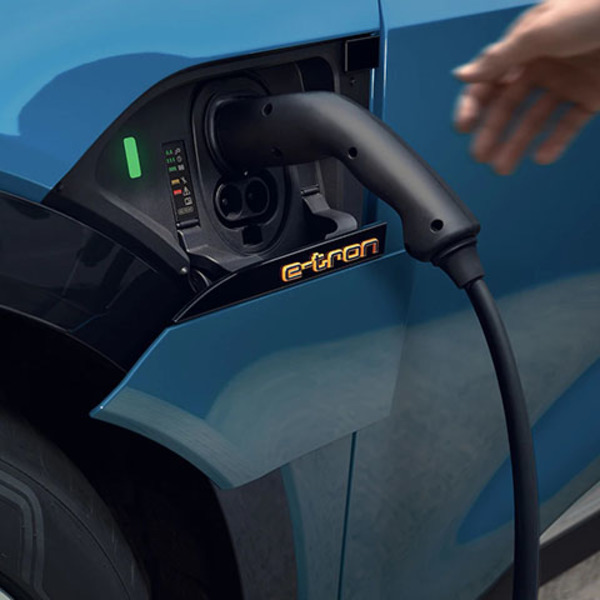 Technically, the flexible charging column is based on the battery pack of the Volkswagen Group’s Modular Electric Toolkit (MEB) platform. 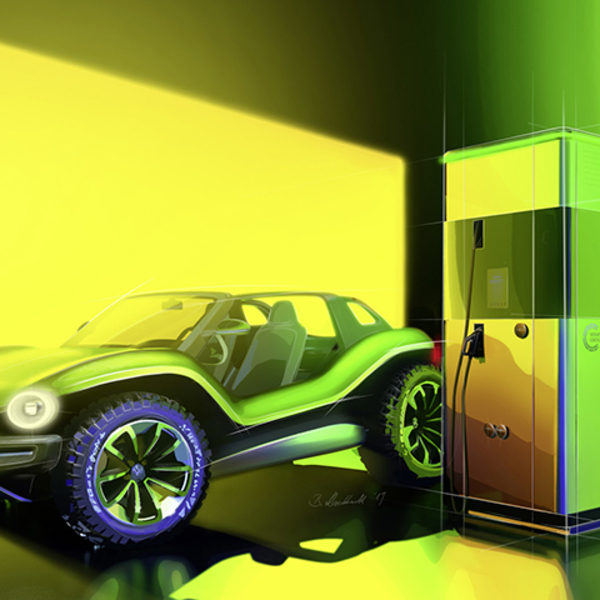 This offers advantages such as allowing batteries from electric vehicles to have a second life. This is because a battery loses charging capacity over time, but if it subsequently passes a thorough analysis, it can be reused in a flexible charging station. Production of flexible charging stations will begin at the Hanover components plant in 2020, gradually replacing heat exchanger production. This will mean that Hanover will be the fourth German component plant to produce components for e-mobility. The Braunschweig plant develops and produces battery systems for all the Group’s electric vehicles. The Centre of Excellence for battery cells is located at Salzgitter, where it will be joined by rotor and stator production for electric motors from mid-2019, and a pilot plant for developing a recycling process for high-voltage batteries from early 2020. The Kassel plant also produces electric motors, while from 2020 onwards Hanover will be focusing on charging infrastructure.